ጥሩ ኃሳብ! አቅራቢዋ በለንደን መካነ አራዊት በሚገኝ የፔንጉዊኖች ክፍል ውስጥ ሆና ድክ ድክ ስለማለት ስለተሰራ ጥናት መሰናዶ እያቀረበች ነው። ፔንጉዊኖች እንዴት እንደሚራመዱ ለመግለፅ የትኞቹን ቃላት ተጠቀመች? 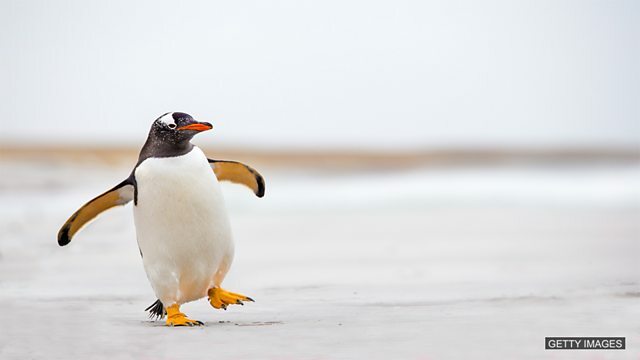 With its tiny legs and stiff, upright posture, a penguin has a waddle that's more than a little ungainly. But by installing a high-tech track in London Zoo, scientists will measure every tiny movement the birds make. ‘A fossil’ ቅሪተ አካል ማለት ነው። የዘመኑ ፔንግዊኖች ጠንካራ ‘stiff’ ቀጥ ያለ አቋቋም ‘upright posture’እና ቀጫጭን እግሮች ‘tiny legs’ እንዳሏቸው ሰምተናል። የዘመናችን ፔንጉዊኖች ከድሮ ፔንጉዊኖች ጋር ተመሳሳይ ናቸው ብለው ያስባሉ? So, they aren’t the same! We’ve heard how modern penguins have an upright posture. Penguins in the past were the opposite! They had a horizontal posture. ‘Horizontal’, አግዶሞሽ ማለት ነው።, which means they were lying flat! ‘To adapt’ መላመድ ማለት ነው። ብዙ ጊዜ ‘adapt to’ የምንጠቀመው ከስም ወይም ከግስና አይኤንጂ ጋር ነው። የመጨረሻውን አረፍተ ነገር እናዳምጥ። ፔንጉዊኖች የተላመዱት ነገር ‘adapt to?’ ምንድን ነው?